The model shown comes with High Capacity magazines, is it possible to switch to 10 rounds, to be able to purchase and ship to California? BEST ANSWER: The XD9SC came with 10 round mags when first introduced. SA came out later with new 13 round mags that comes with this gun. 10 round OEM mags are still available. Both work just fine. He wasn't asking about the availability of the 10 round magazine sold separately. The original poster wanted to know if PSA could ship this gun with 10 round mags instead of the 13/16 round mags because CA won't allow mags over 10 rounds to enter the state. Does this come with 2 mags and the hard case? Does this gun have different grips? Is this model Mod 2 version? BEST ANSWER: No. It will say Mod 2 in description. Never held a mod 2 but have had this one for 6 years. My wife has one too. Love this pistol. Can anybody tell me how is the recoil from this pistol?? BEST ANSWER: I have the Mod .2 basically the same gun and I have no problem with the recoil. BEST ANSWER: Plastic case and 2 magazines. One is 16 round with the extension on it, and the other fits flush to the bottom of the grip, I think it is 10 round. Mine came with the standard cleaning brush , 1 extended 16rnd mag, 1 10rnd flush fitting mag and 1 lock. Great edc! The pistol comes with 2 magazines. How is the recoil ? What safeties does it have? BEST ANSWER: The XD has a palm safety like a 1911 and a trigger safety like a glock. The gun will not fire unless both safeties are pressed. It works everytime you squeeze the trigger and very accurate for a sub compact. No complaints. Another great gun from Springfield. This may end up being my EDC if I can find a good holster. Even my wife liked shooting it. Palmetto always has the best prices! Very nice gun. Good fit to my hand. Extended magazines are a plus. High quality, great shooter. Many nice features..but..too heavy for me as a CCW. Should have done my homework. This "subcompact" is quite large. However, it is well engineered and reliable. Love this little gun it is a nice addition that both myself and my wife can both carry. Only problem I have is that I regret not buying 2 at the price. I like how Springfield offered additional mags for free. Second gun I have bought from PSA and it’s pain free deals. Great price and great service! This is the first hand gun that I have purchased for myself. I wanted something of this size but didn't want to pay an arm and a leg for it as it is my practice range gun. I was told to look on this site for a deal. I came across this gun at a great deal, and had to purchase it. The gun store down the street from me received the gun super quick and the process was so easy and fast. Thank you! I received the Springfield XD 9 in 4 days from the order date. This sub-compact model is very easy to conceal for all you CCP holders. I haven't shot mine yet, but have shot the exact model. It's a accurate shooting gun with a 16-round capacity. The price was the lowest I've seen for this model since I've been looking at it for the past 6 months...$339! Shipping was FAST and the gun was everything I expected from Springfield. Shot 150 rds today and they all fed perfectly. XD9 Rocks! Great price, great service. Can't lose with Springfield Armory promotion extra magazines and range bag for FREE! Awesome gun at a great price. It is hard to beat PSA's sales. Excellent firearm, fast shipping, always a great company to do business with. Feels amazing in my hands. Could t be happier!! Love it and a great price. This is my first handgun purchase and I am delighted. I wanted a concealable handgun with decent ammo capacity. I got both with the XD9. Gun shoots well and fits into my hand perfectly. I'm impressed with the build quality and the safety features. The takedown on this firearm is very easy which makes maintenance and cleaning a breeze. Oh yeah... the price was right too. I LOVE this pistol!! I bought an XD Subcompact in .40 S&W years ago and was immediately impressed with its reliability accuracy and ergonomics. So when I found the XD Subcompact in 9mm on sale a couple of years ago I snagged one. Again I was extremely pleased with it. 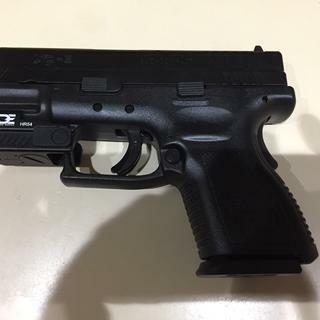 My only wish - not a complaint - was for the XD to be a little thinner since I'm not a big guy and carry in Florida. I thought Springfield answered my prayers when they came out with the XDs. Wrong! The XDs I have in 9mm is a big disappointment - nothing but problems. My pain was eased when PSA's Black Friday sale offered the XD 9mm Subcompact for $349 shipped. I'm just that way - if I REALLY like a gun I often buy a second one if the price is right. Once again after a quick field strip and lube before the first range trip my XD Subcompact from PSA performed flawlessly. It ate everything I fed it and when an old guy like me with bad near-vision can shoot the bullseye out of a target at 25 ft. you KNOW it's accurate! Since I LOVE the XD Subcompact I may even buy a third in 9mm! Or a 2nd in .40 S&W - make me an offer! Bottom line: If you're looking for something reasonably concealable that you can ABSOLUTELY trust your life with AND at price that won't break the bank THIS IS IT! Great carry gun if you are willing to live with its shortcomings. PSA is offering these very reliable pistols at a superb price. I was given one of these lightly used by an old friend a few years back. They are reliable but have a slightly too heavy and spongy a trigger for my taste and a great light as possible trigger is a MUST for decent accuracy with a gun this size. You will find that you are "stuck" with the trigger provided as there simply doesn't exist the vast array of aftermarket trigger upgrades one can find for say the Glock 26 which by simply using a Glock 19 or even Glock 17 mag and an inexpensive "spacer" sleeve can easily provide you with a high capacity handgun that actually weighs less than this Springfield offering. I prefer my Gen3 Glock 26 with its Pyramid trigger which I can tweak to 3.25lb and that breaks like a tiny glass rod. The price is more but the groups are over twice as small as the best I can manage with this Springfield. At the price though as a "glove box" gun this may be a very good pistol and perhaps a good gunsmith can be found that is willing to try to improve the factory trigger that you are pretty much stuck with when buying this handgun. You won't cry long if you drop this bargain priced pistol into a lake not at the price PSA is offering them for. Went to PSA for the daily deal...$369. Own the 4 inch service model of this weapon. Bought this model for size not sacrifice load count. Gun is perfect in size has good weight. Function and fit are expected. The 4 inch service model mags are the same as the 16 round included less the plastic extension. Never bought a weapon from these guys before. I picked the place where I wanted it to go. Was going to follow up with PSA to see if recipient had FFL on file. Then I got an email saying it shipped the next day. I mean it was super simple no problems. Total turn around was 3 days. I just wanted to come back and let others know. If these pop up again get one. Love the weekend deals! I bought the XD9 Sub-Compact last May. It has been an excellent carry weapon. It fits discreetly in my IWB holster without discomfort. As far as control is concerned its weight and grip seem to lend to accuracy. I have several other 9mm pistols and tend to like this over them all (including my full size XD). 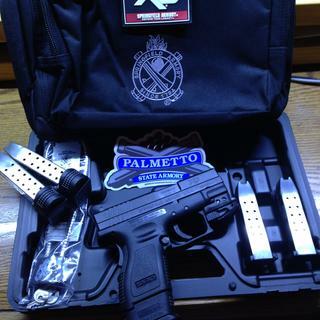 Also Palmetto State Armory is definitely the place to buy! I ordered my first 9mm compact 5 months ago have been very impressed. One of the best I have ever shot. After my wife tried and hit several bulls eyes with it I have just ordered my second. PSA was great with the shipping on the first I hope they are as fast with the second. So great gun and service overall. I got this as a Christmas gift last year thinking that I would alternate between the XD and my Glock. I end up carrying this pretty much all the time now. It is heavier than some of the sub compacts I have seen but not to the point it is uncomfortable. The price is perfect for a top name quality weapon. PSA has a customer for life!